ATTENTION ALL CBSers that worked at GCT! I hope you don’t mind my emailing several of you associated with the CBS Retirees website. I’m hoping to get more information about the sign in the attached photo. 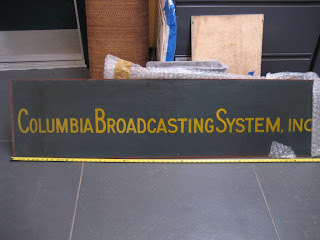 Metro-North and the Transit Museum recovered this sign in the space that was occupied by CBS when renovation to the tennis courts at GCT was underway. It measures 5 ½ ft. x 17 in. and appears to be hand-painted lettering on steel. The photo may make it appear a bit warped or curved, but it is flat and straight. If you know where this sign was actually placed, have a photo of it in place or just have a best guess of where it went, we’d be most grateful. The NY Transit Museum is staging an exhibit for Grand Central’s Centennial next February and we think this artifact would help to tell CBS’ part of the GCT story. It says more about the object and the studios if we know where it belonged. If you expect to see others at your fall luncheon, perhaps sharing this photo with other retirees would help as well.